"I have a problem—unexplained excessive sweating, like just stepping out of the shower, hair dripping wet, clothes soaked! ... It has put a big damper on my lifestyle." "My limbs get so cold and painful … and yet my face will be sweating from the heat inside." "What exactly causes the excessive sweating? ... I don't bother to wear makeup in the summer because there is no point—it just melts off." That's understandable since we have much bigger problems. 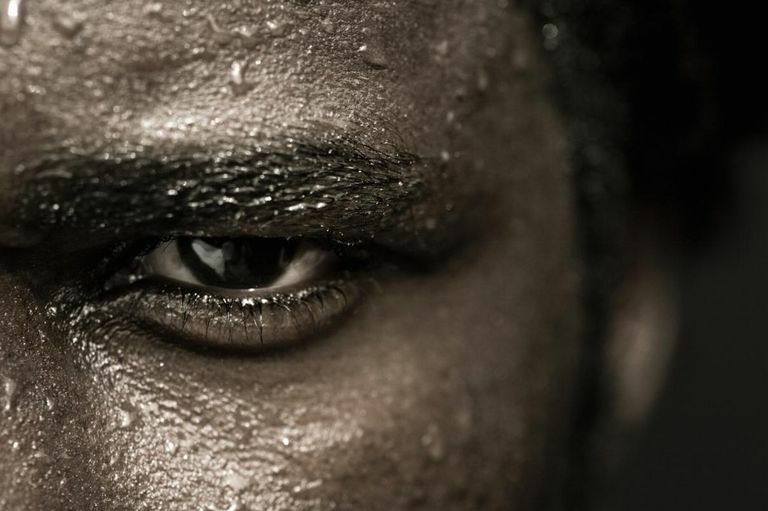 Still, heavy sweating can have a major impact on your life. The only cause that's "curable" is the medication side effect, and that may not be an attractive option to you if the drug is doing more good than harm. However, some medications may help control your sweating, so it's worth bringing up with your doctor. Loose powders on your face or other sweaty areas may help absorb sweat before you even know it's there. You can also apply it after drying sweat off of your skin to keep from being shiny. Oil-absorbing face wipes can keep you from having greasy-looking skin as well. They're generally better than napkins or tissues, which work in a pinch but may be worse for your skin as well as less effective. If your sweating isn't tied to any particular stimulus, you might not be able to keep it from happening. However, if it's tied to heat—and especially our tendency to become overheated—you may find that some of these things reduce the problem. ​Once sweating starts, it may be difficult to stop, so you're better off trying to prevent it in the first place. One important thing about excessive sweating is making sure you stay hydrated. It's important to replace both the water and the electrolytes you sweat out. If you think you need to replace electrolytes but don't have a sports drink handy, you can get them via supplements or even through food. It can be hard for us to tell when we're dehydrated because the symptoms can be similar to some we already have. You should make sure to know the symptoms of dehydration. Atarowska M, Samborski W. Annales Academiae Medicae Stetinensis. 2006;52 Suppl 2:105-10. (Abstract only; article in Polish) Difficulties with diagnosis of fibromyalgia: case report. Collins S, van Hilten JJ, et al. Archives of physical medicine and rehabilitation. 2008 Jun;89(6):1114-20. Development of a symptoms questionnaire for complex regional pain syndrome and potentially related illnesses: the Trauma Related Neuronal Dysfunction Symptoms Inventory. Demling J, Beyer S, Kornhuber J. Medical Hypotheses. 2010 Jan;74(1):155-7 To sweat or not to sweat? A hypothesis on the effects of venlafaxine and SSRIs. Furlan R, Barbic F, et al. Respiratory physiology & neurobiology. 2009 Oct;169 Suppl 1:S17-20. Neural autonomic control in orthostatic intolerance. Schutz B, von Engelhardt J, et al. Neuroscience. 2008 Oct 2;156(2):310-8. Sweat gland innervation is pioneered by sympathetic neurons expressing a cholinergic/noradrenergic co-phenotype in the mouse.